codshit.com: MI5 Killers Sabotaged Chinook Helicopter That Crashed at Mull of Kintyre in 1994 Finally Exposed? 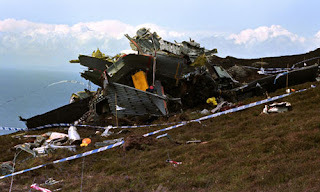 are no comments to the assassination of 29 British security officals, apparently by MI5 and its military colleagues, at the Mull of Kintyre on June 2,1994. As for Ian Phoenix's group being the peacemakers, it is quite clear from reading the book about him by his wife Susan and Jack Holland. In fact, the book would not have appeared if it weren't. And while Martin McGartland was on the run from the PIRA in Britain, he went out of his way, and at some risk to lay a wreath at the cairn for the fallen 29 at the Mull who had worked so hard to achieve his goal. And was the MI5-FRU mission to get rid of the peacemakers a copycat one of what the Mossad had apparently adopted when a bomb killed 29 people at its Embassy in Buenos Aires two years before - what was so striking that it also had to carry out bombings of its Embassy and Balfour House right after the Mull tragedy in London to prevent investigators from spotting the similarities? While it seems obvious why no one has supplied it - it is to dangerous to suggest - I guess I shall have to do it myself. The chinook helicopter crashed because its victims - many of whom had been brought into FRU collusion in loyalist killings of Provos, or had been lied to about it - were willing to tell the Stevens inquiries into it all about it. The victims who knew about it, and had finally decided to help stop it were RUC SB officers like Assistant Chief Constable Brian Fitzsimmons, and those who had been lied to about it, including, its seems, Detective Superintendant Ian Phoenix. It was RUC Chief Constable Hugh Annesley who had tried to keep the lid on the collusion, and it is he and his like-minded colleagues who worked with those in MI5 on the mainland, starting with its current Director Jonathan 'Bob' Evans, who still have to answer for what happened. When the 29 occupants of the chinook were murdered, Stevens was finally obliged to close the door on the massacre, thanks to the trick that Martin Ingram aka Ian Hurst had worked out with the FRU's Phil Smith about the conditions under which Hurst was willing to testify about the collusion. Given the unwillingness of Britain to seriously investigate such state-sponsored murders, though, don't expect anything to happen anytime soon. The survivors of the six PIRA volunteers killed by Loyalists in a bar at Loughinisland, Northern Ireland in June 1994 suing the MoD and the PSNI for colluding in it show just how deep the campaign was. There was no way that they would have done it if the Provisionals were not already on the ropes, thanks to the sabotaging of that Chinook helicopter at the Mull of Kintyre a fortnight previously. With the softmen men of the PSNI, MI5, and the MoD conveniently murdered, the bar massacre was allowed to go ahead, and it helped convince the hardliners in the PRIA Council that the war was well and truly over. Wonder if this will come out in the trial, and the compensation for all the state-sponsored killings.